During the summer of 2014, Chicago actors Tom Vendafreddo and Devin DeSantis were in a production at the Marriott Theatre in Lincolnshire, IL. Between shows one day, a conversation erupted about how much they missed singing in choir. After they shared some of the highlights from their past choral experiences, Tom posed a question, "Is there any reason why we shouldn't start a choir for people in the same boat as us?" And thus the Chicago Artists Chorale was born! 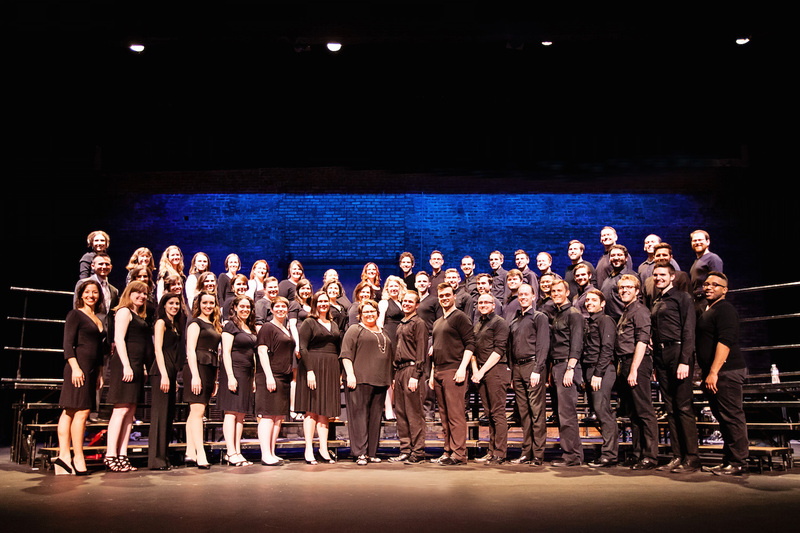 The chorale is comprised of actors, directors, professors, stage managers, teachers, instrumentalists, drag queens, and so many other types of artists! For one night a week, this group of people comes together and volunteers their time to sing choral music. Our mission is to gather as a community of artists and express ourselves through the art of choral music. In doing so, we will strive to expand our artistic experiences, grow as musicians, and embrace the power of the ensemble. Tom has music directed, conducted and appeared on stage at many Chicago theatres including the Paramount Theatre, the Marriott Theatre, Chicago Shakespeare Theatre, Drury Lane Theatre, Writers Theatre, and the Bohemian Theatre Ensemble. His choral career began at age 8 with the Palatine Children’s Chorus. Since then, he has literally traveled the world with countless choral groups. For a brief time, he was the conductor of the Northwest Choral Society and has conducted several church choirs in Rochester, NY and the Chicagoland area. Tom is a proud graduate of the Eastman School of Music and has an MFA in Musical Theatre from San Diego State University. Devin discovered his love of music as a boy in the Colorado Children's Chorale. This incredible children's choir determined and continues to inspire everything he is as an artist and a person. He is a performer in Chicago where some of his favorite credits include Tommy in The Who's Tommy and Marius in Les Miserables at the Paramount Theatre, Dr. Frederick Frankenstein in Young Frankenstein at Drury Lane Theatre and Matthew in Altar Boyz Chicago. Devin is a proud graduate of Northwestern University's School of Music. Justin is originally from Nebraska, where he earned his degree in vocal music education. While there, he performed and music directed in many theaters, church choirs, and youth ensembles. He was fortunate to work as a stage manager for Opera Omaha and as a dresser for the national tours of Wicked, Mary Poppins, and South Pacific. Justin continued working as a music director and educator after his move to Chicago in 2011. He currently teaches music & life skills in the special education classroom at Walter Payton College Prep. Rachel Sherman is thrilled to have come on board as the Director of Engagement for The Chicago Artists Chorale. Rachel has been with The CAC since 2015 and has been a choral singer since she turned double digits. When not singing with the Chorale or Ensemble, Rachel works as the Education Director of Emerald City Theatre and is a guest lecturer for Harold Washington College's theater department.